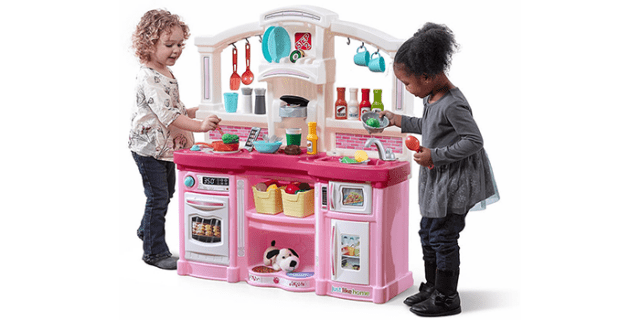 Play kitchen sets are without a doubt among the most popular toys out there and it’s easy to see why. The big appeal with these type of toys is that they stimulate children’s cognitive development through the power of imitation. That said, kids love to play pretend and cook up plastic dishes of their own making. 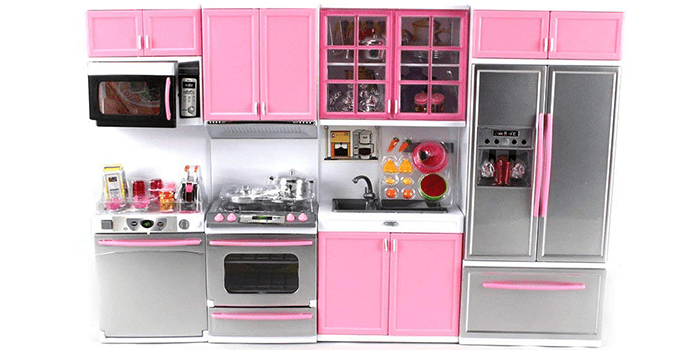 It also needs to be said that these play kitchen sets have become quite elaborate over the years and are nowadays enjoying their utmost complexity and convenience. With that in mind, let us take a look at the ten best play kitchen sets out there and perhaps figure out what exactly makes them so appealing to begin with. 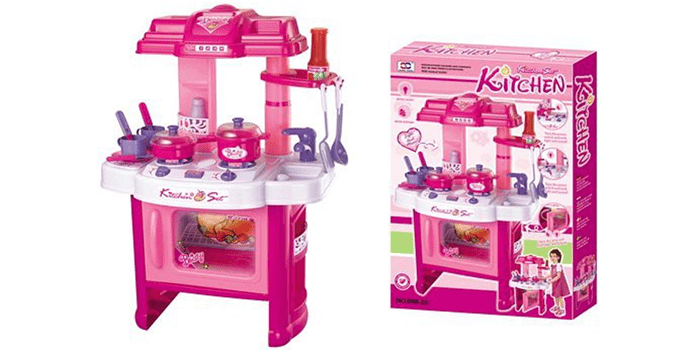 The Liberty Imports Deluxe Beauty Kitchen Appliance Cooking Play Set is a premium quality girl’s kitchen set designed with colorful lights and exciting sounds. Including 2 stoves, a small cabinet and a wide range of accessories like pots, pans, spoons and more, it contains all you need to keep your child busy for hours. Measuring 16 inches in length, 10 inches wide and 24 inches high, this kitchen set produces delightful sounds and lights that automatically turn on when you open the oven door or switch the power on. 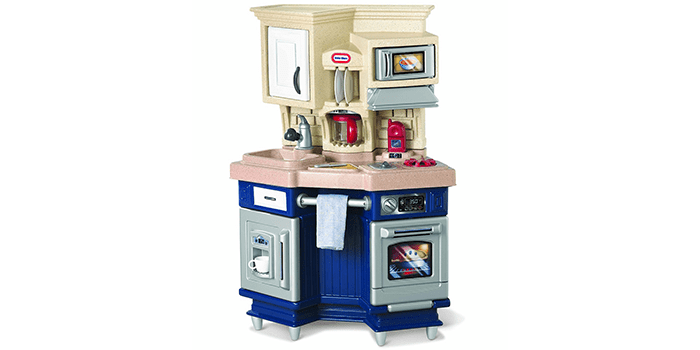 Operated by batteries, the Deluxe Modern Kitchen Playset gives your child the opportunity to experience the reality of a complete kitchen along with a stove, a refrigerator, an oven, and a sink. With exciting sounds and lights that turn on for the stove and the microwave, it offers a realistic cooking feel for your child. Designed with cabinets that open, it provides space for your child to store anything they like while exploring and enjoying their play time. Ideal for dolls that are 11-12 inch in size, this kitchen play set comes along with a range of accessories including mini pots and pans, a teapot, tea cups and plates, food and more. 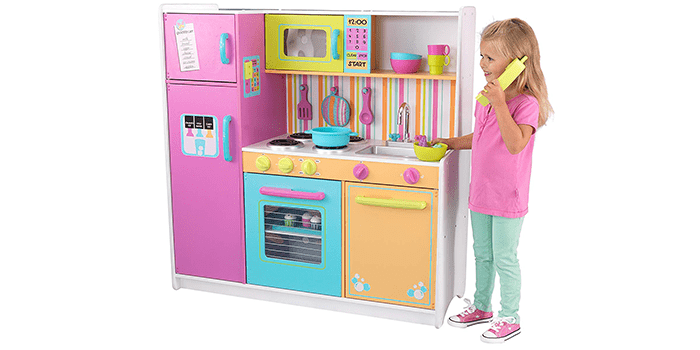 Featuring a modern style, realistic design, and construction, the Step2 Cozy Kitchen includes 21 pieces that would help enhance your child’s understanding of a real kitchen. Equipped with an oven and a refrigerator that open up, it allows your child to store their other toys and play items, helping save valuable space. It also comes with storage cabinets and other kitchen utensils which look real. Unlike most kitchen sets, this one includes a sink with a movable faucet and features a stylish contemporary countertop. 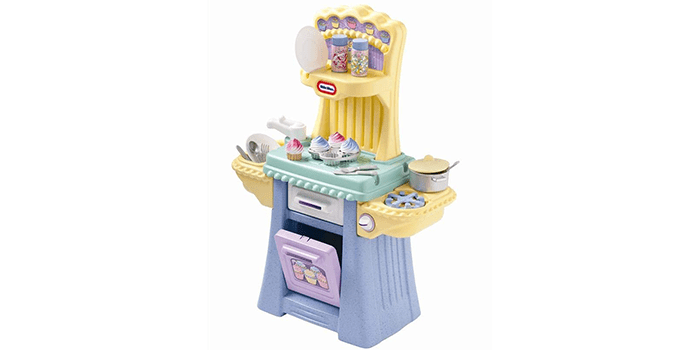 Uniquely crafted with a great set of features, the Little Tikes Cupcake Kitchen is constructed with a sturdy, high-quality plastic body that is ultra-durable. Featuring stove burners that produce real cooking sound effects, it comes equipped with a real drawer, oven doors that open and a little storage space for the other accessories included with this kitchen set. The other items include a cupcake tray, 2 forks, 2 spoons, 2 plates, 2 knives, 4 cupcakes, 1 pot with a lid, 2 spice shakers and a spatula. Equipped with an electronic stove top burner, the Step2 Great Gourmet Play Kitchen features real cooking sounds and lights that help in accentuating your child’s playing and learning experience. Including a realistic refrigerator, microwave oven and cabinets with doors that open, it helps stimulate the child’s imagination. Featuring a modern, stylish design and outlook, this kitchen set includes a chalkboard that is an additional fun feature allowing children to keep a track of their groceries. It also includes storage bins on the side that help save space and makes cleaning up easy. 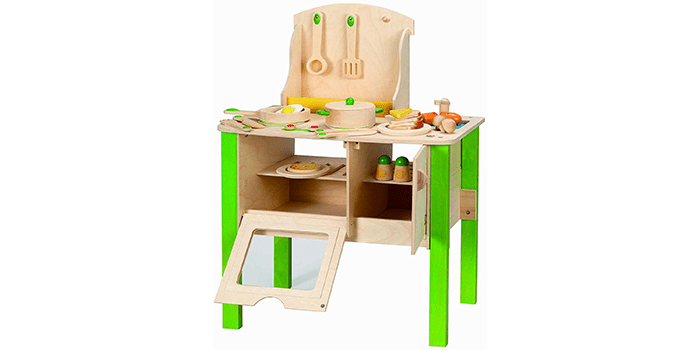 Made with high-quality solid wood, My Creative Cookery Club kitchen set from Hape’s features a blend of natural as well as painted wooden textures. 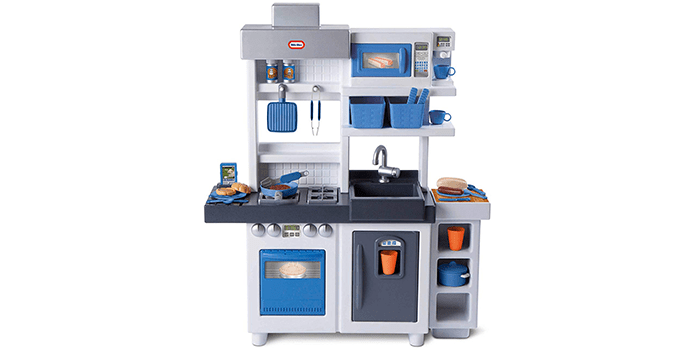 Including the kitchen set frame, cooking utensils, toy food made from wood and other accessories, this kitchen set encourages kid’s to understand more while helping them to imagine and experience real role-playing situations. Including all the tools and hardware needed to set up this kitchen set, installation is easy and can be done quickly. Unlike any other of its kind, this set offers durability, is unique and extremely fun to play with. 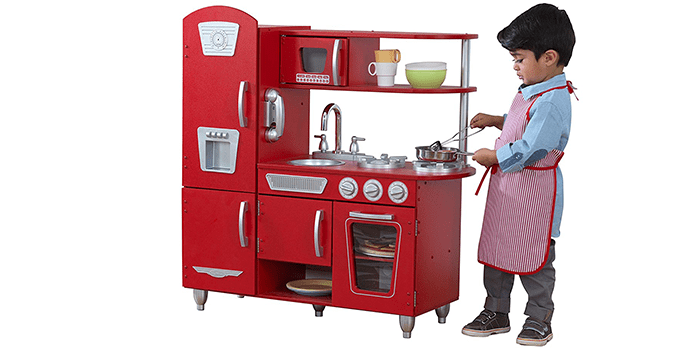 The Little Tikes Ultimate Cook Kitchen is a durable, premium quality kitchen set that is packed with a ton of great features and accessories. 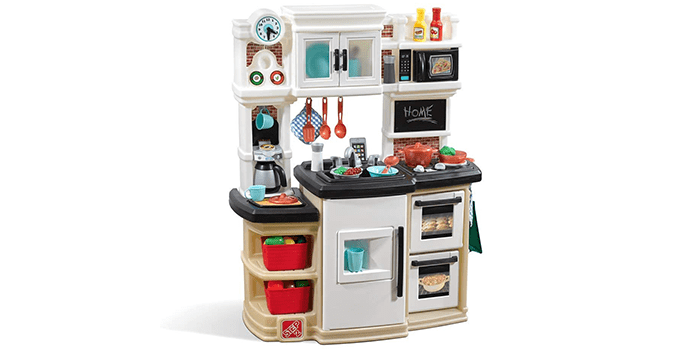 With a large countertop, a fridge, oven, and microwave with opening doors, storage space with additional shelves and cabinets that open, this kitchen play set comes with 38 pieces that help enhance your children’s learning experience. Alongside the accessories, it also includes real pegs to store kitchen utensils, knobs that click and special cooking sound effects that are produced by the stove top and the sink. It also comes with an added cappuccino maker to help modernize the kitchen. The Red Retro Kitchen is among the best of its kind, popularly known for its premium quality and realistic features. Including doors that open and close, it features oven knobs that click when rotated. Crafted and designed in a vibrant red color, this kitchen boasts a modern style and outlook. Measuring 33 inches by 13 inches by 35.70 inches respectively, it is an exciting addition to your child’s play area. Including a removable sink that allows easy cleaning up, it also comes with a cordless phone to enhance your kid’s playing experience. Equipped with a sturdy frame made from high-quality materials with a vibrant colored background, the KidKraft Deluxe Big & Bright Kitchen comes with a wide range of fun accessories and features. Including added storage above and below the sink area, the sink can be removed to help with quick and easy cleaning up. With knobs that turn and click both on the oven and the sink, it comes with a refrigerator and oven and a microwave with doors that open. 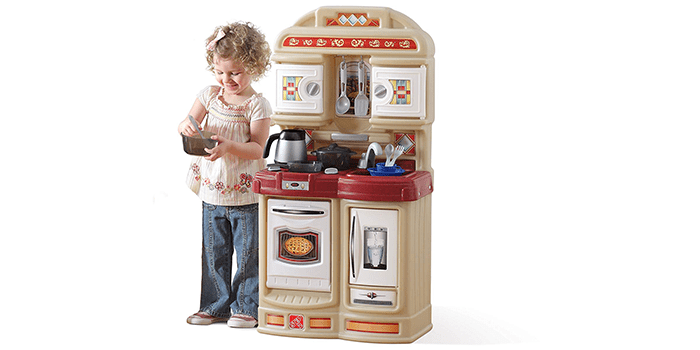 Thanks to its large size, two or more children can play with this kitchen set at the same time. Designed in a modern, stylish outlook, the Little Tikes Super Chef Kitchen makes an ideal addition to your kid’s play toys. With a cabinet that opens with storage space inside, a microwave alongside tiny oven doors, it comes equipped with clicker knob on the oven and a burner that produces cooking sounds making it more real-like. The refrigerator door also opens with space to store food and there is also a chrome-colored towel rack. Thanks to the durable sturdy feet under the base, it adds height to the kitchen set. The complete set includes a coffee pot, 2 plates, 2 knives, 2 cups, 2 spoons, and 2 forks, a frying pan, and a cordless play phone for good measure.